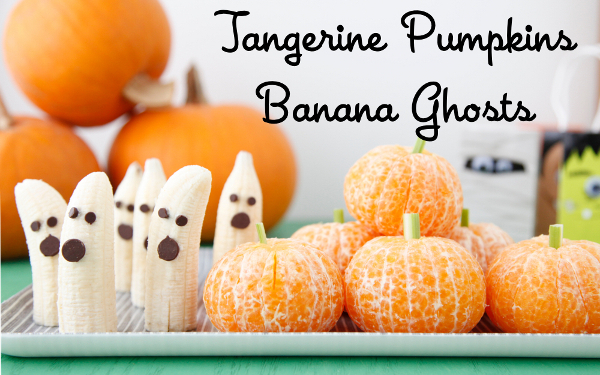 Here’s some fun after-school Halloween-themed snacks that are easy to make (more or less) and healthy too. 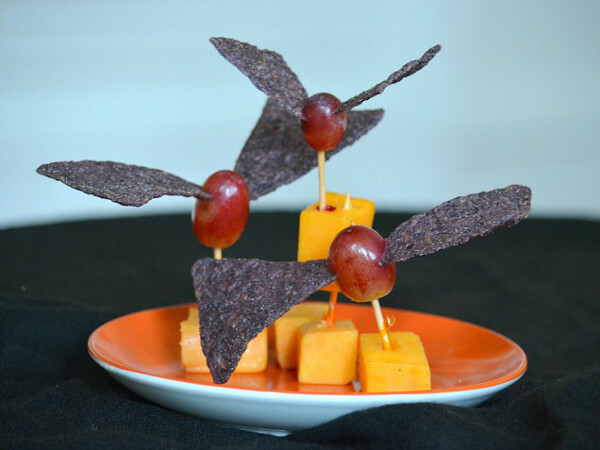 Bat Bites: Grape “bats” with black tortilla chip “wings” perched above cheese cubes. 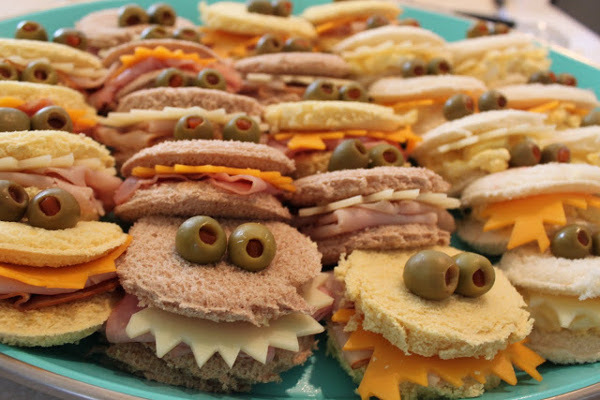 Monster Sandwiches: Round sandwich bread, olive eyes, and cheese teeth. 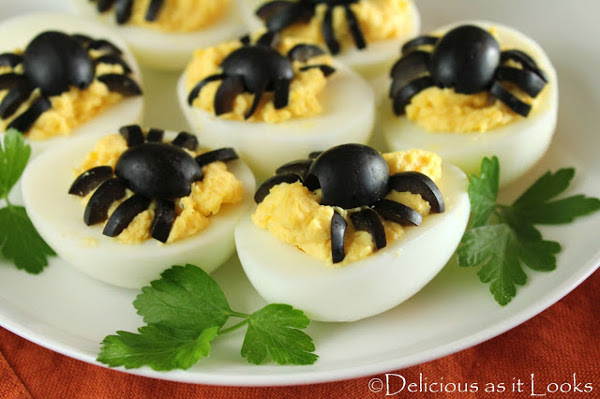 Spider Deviled Eggs: Deviled eggs with olive “spiders” on top. 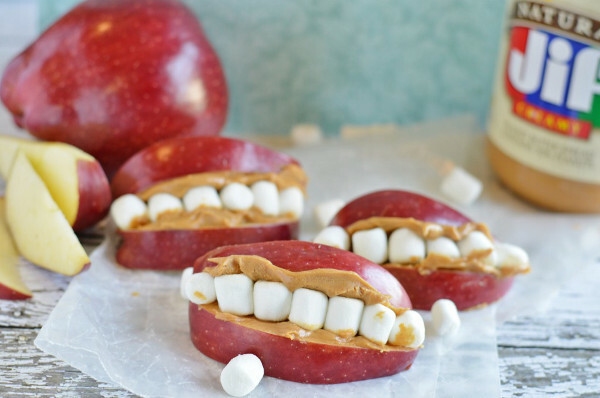 Apple Mouths: Slice apples, hold them together with peanut butter, and add marshmallows for the teeth. Tangerine Pumpkins and Banana Ghosts: Tangerines with celery stems make good pumpkins and banana ghosts with chocolate chips for eyes. So cute! 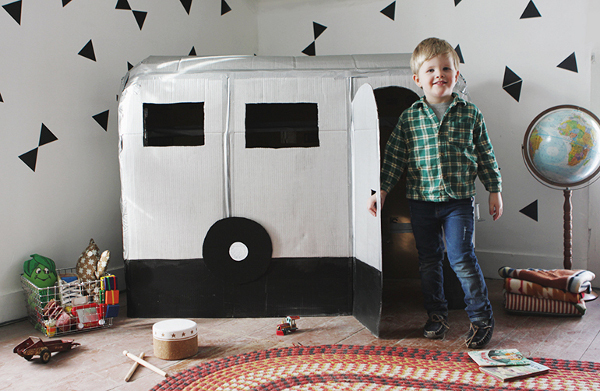 A DIY Cardboard Camper Playhouse. All it takes is a big box, paint, and duct tape. 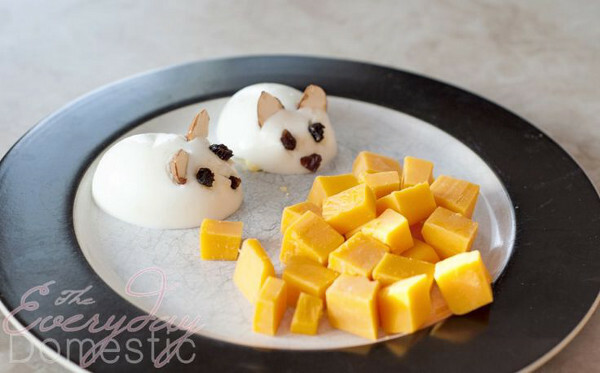 Hungry Mice: The mice are made out of hard-boiled eggs with raisin eyes and almond ears. And of course, don’t forget the cheese. 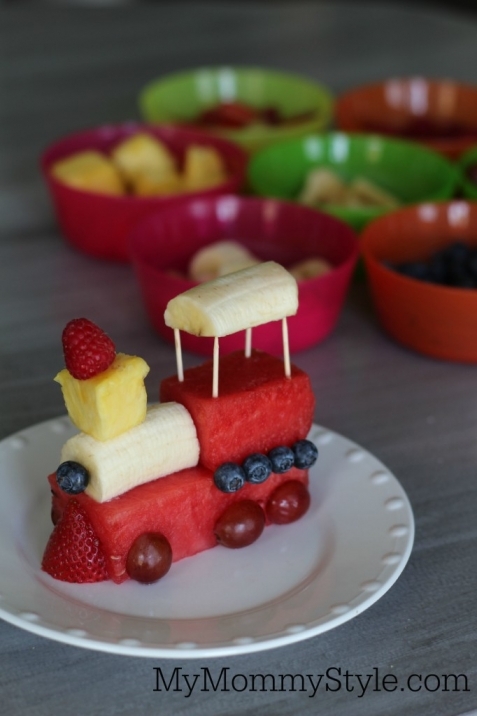 Fruit Train: A train from watermelon, bananas, grapes, blueberries, strawberries, raspberries, and a piece of pineapple, held together with toothpicks. So cute! 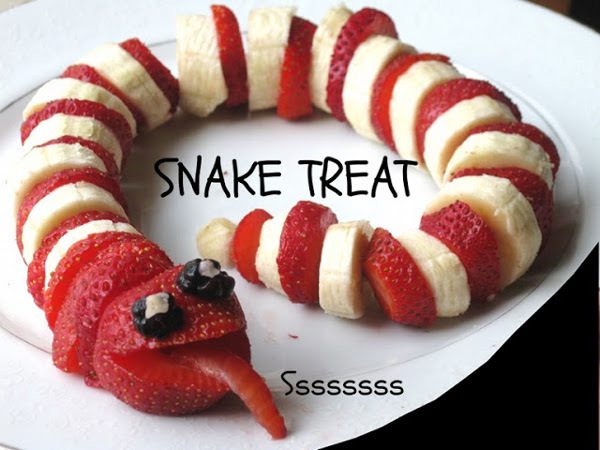 Fruit Snake: Strawberries and bananas, cut and arranged in a snake shape, with a strawberry for the head and a blueberries for the eyes. 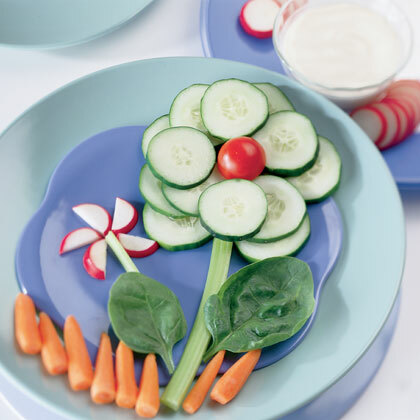 Veggie Flower: Cucumbers, tomatoes, celery, spinach leaves, carrots, and radishes, arranged in the shape of a flower. Serve with hummus, ranch dressing, or some other kind of dip. 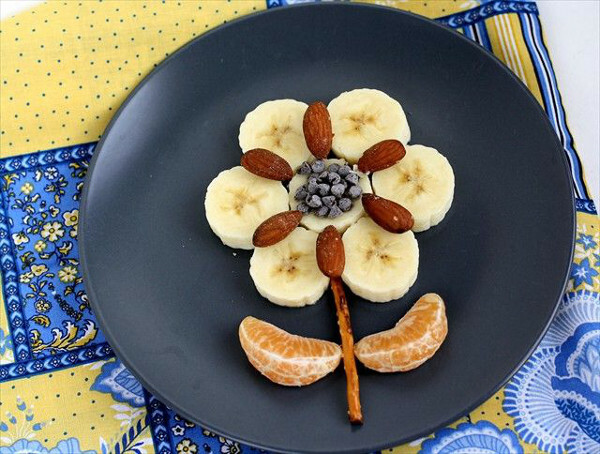 Fruit Flower: Here’s the same idea with bananas, almonds, pretzels, tangerines, and chocolate chips (could also use blueberries). 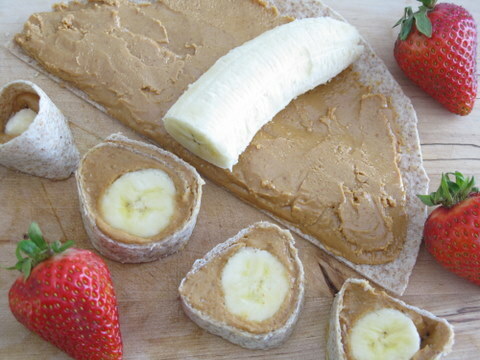 Banana Rolls: Take a whole wheat tortilla, spread peanut or almond butter inside, then place a banana in the middle. Roll and slice into sushi-shaped snacks. 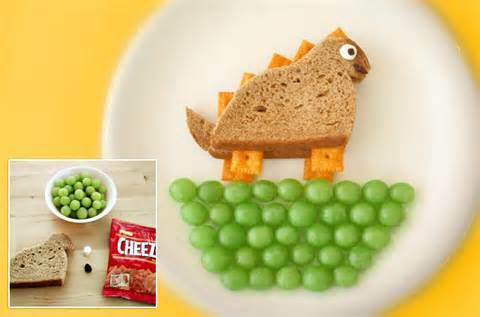 Dinosaur Sandwich: Cut the bread in the shape of a dinosaur, make a sandwich. Then use cheese crackers for its spines and feet, and stand him on some grapes. 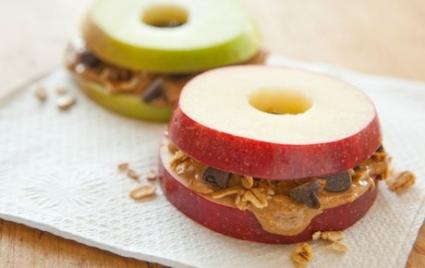 Apple Sandwiches: If that’s too complicated, try these apple sandwiches. Fill two apple slices with options like nutella, peanut butter, almond butter, raisins, granola, chocolate chips, or anything else that sounds good. 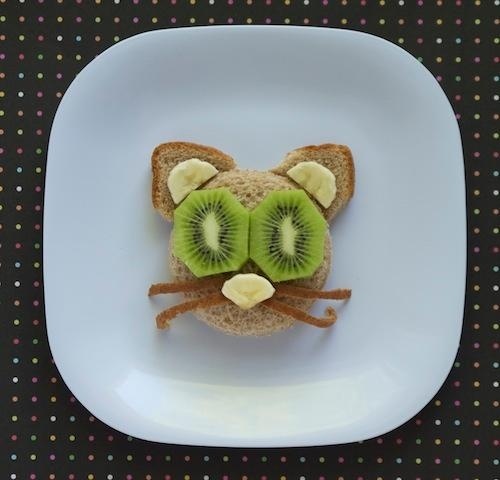 Green-Eyed Kitty: And for my personal favorite, make a cat with a round sandwich of your choice, kiwi slices for eyes, and bananas for the ears. Adorable. 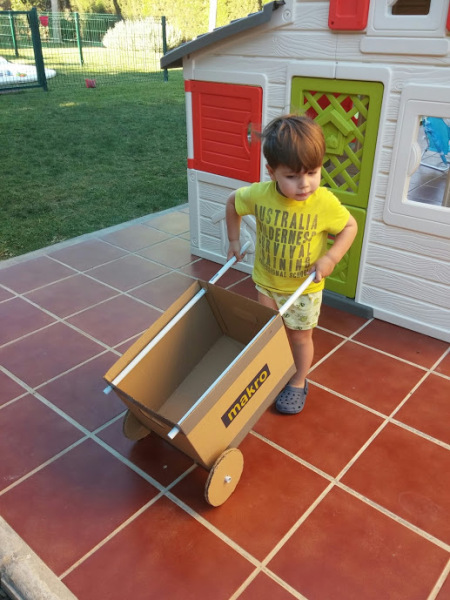 Check it out: the 5-Minute Cardboard Wheelbarrow. 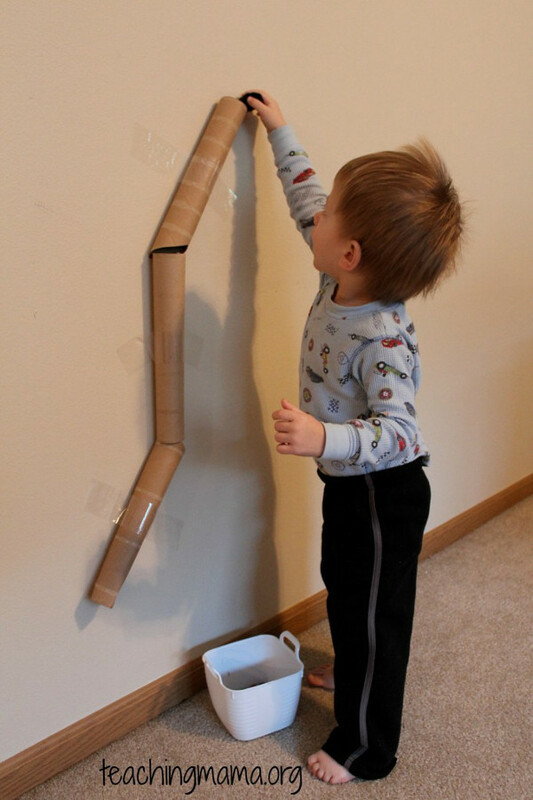 It’s made out of a cardboard box and PVC pipe. A great toy for little time and money. Is there no end to the toy potential of a cardboard box? 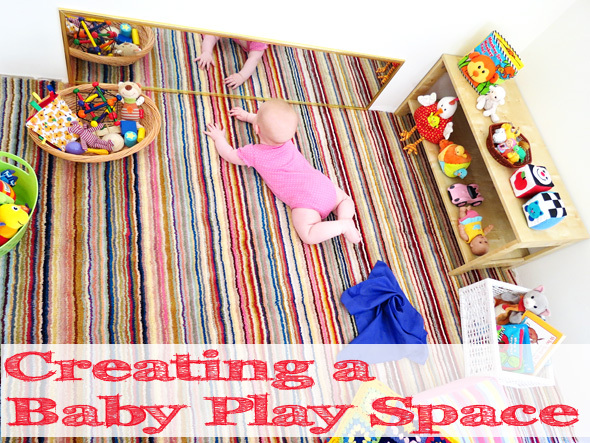 I like this cheerful play space for a baby. It’s stimulating without being over the top (or ugly). 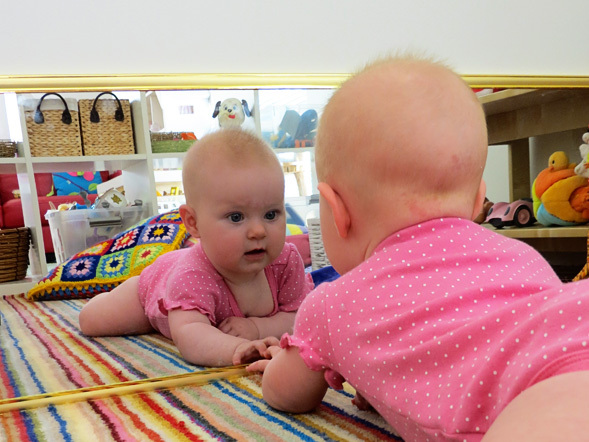 The sideways mirror at baby level is a great idea. 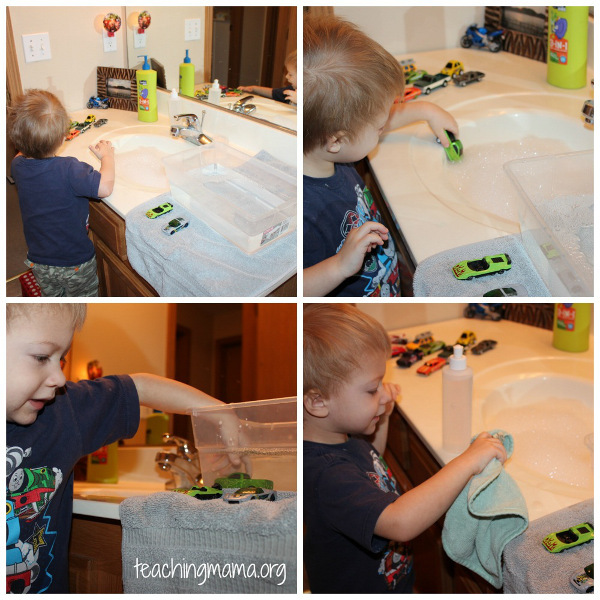 Teaching Mama has a great post on 20 Toddler Activities. They’re great because they mostly use things you already have around the house. Here are a couple I particularly liked. 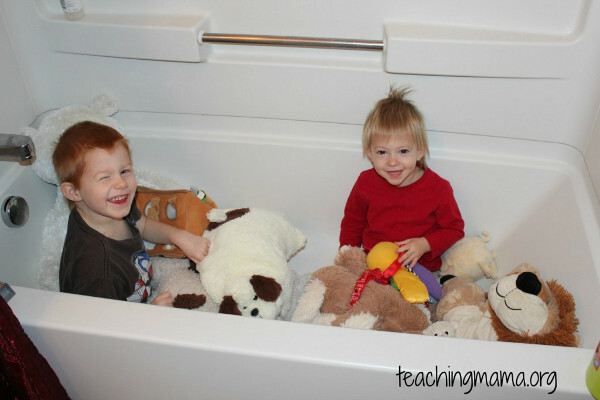 Simple and easy: stick the kid and the toys in the bathtub. Then somehow keep them from turning on the water. Drop the pom poms through the tube and watch them fall. Over and over again! Next time Savvy Jr. is driving my crazy feeling energetic, I’ll have to keep these in mind. 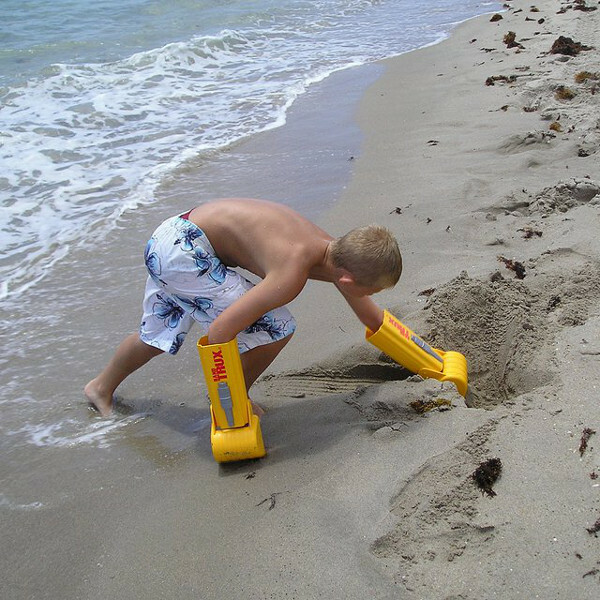 Click here to read 17 more toddler activities. 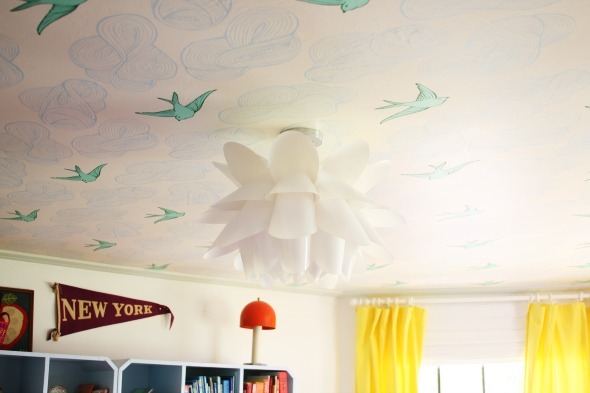 I love this idea from Little Green Notebook of putting wallpaper on the nursery ceiling. This is Daydream wallpaper from Hygge & West. It’s $150 a roll, but ceilings take up less space than walls. 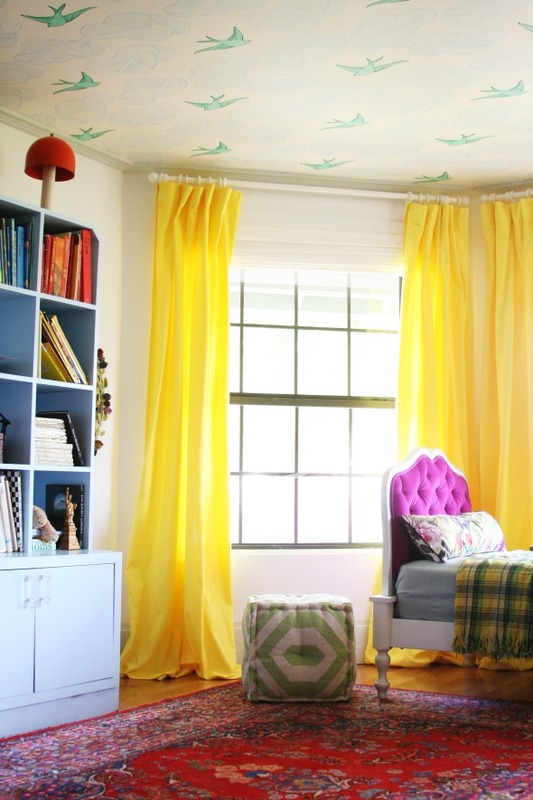 This is a great way to add playfulness to the room. Love it. I cut up finger food like cheese, raisins, olives, and strawberries, and put them in the cubbies, and he enthusiastically eats all of it. By the time he’s done, he’s had a pretty decent meal. 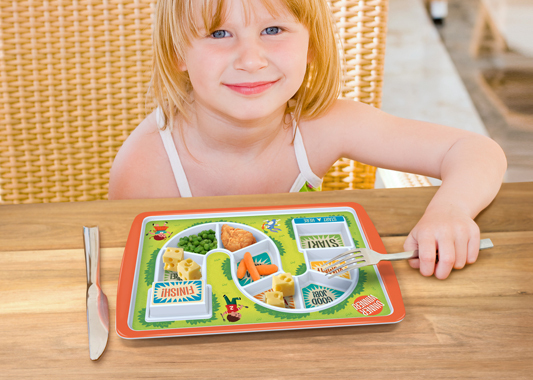 The plate is sturdy and good quality, and safe for the dishwasher, though not the microwave. 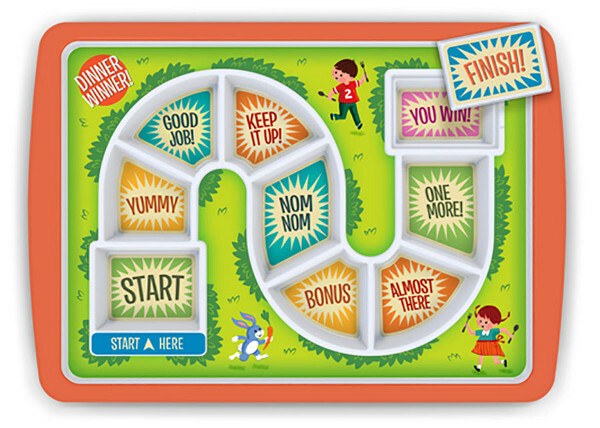 It would work well for a picky eater. $20. Is it cheaper to make your own bubble soap? 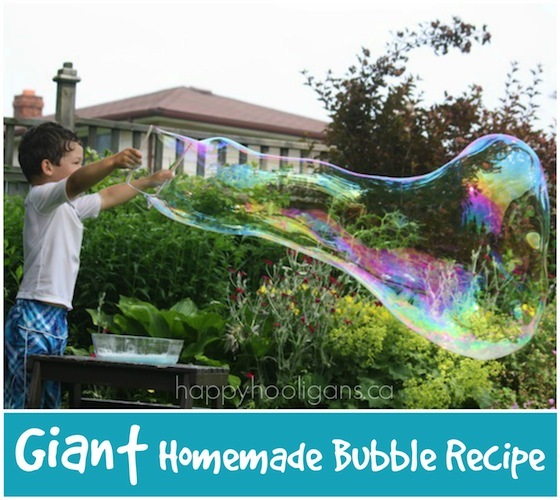 I’m not sure, but for what it’s worth, this recipe seems to work, especially for giant bubbles. Impressive looking. I may try this recipe sometime soon.